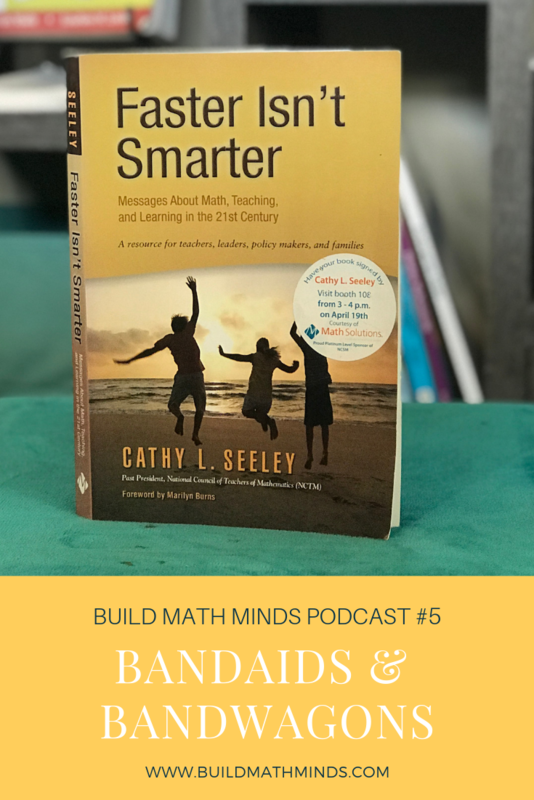 Welcome fellow Recovering Traditionalists to Episode 5 where we take a look at how Bandaids and Bandwagons are something you need to avoid when teaching mathematics. If your school system can describe what they want math education to be like, then when you are contemplating something that could be a Band-aid or a Bandwagon you can weigh it against your description of what math education is supposed to be at your school. You shouldn’t be adopting a new curriculum or implementing math workstations and using that label as what your math program is. I hear things all the time like “We do Engage or We do Guided Math”, those are just labels. I want to encourage you to have your school really look at WHY you are doing that and create a description of what math class should be like for your students. The same is true for Build Math Minds… I really don’t want this concept of Building Math Minds to be a bandwagon. I want you to learn the research about what you are implementing. Go deep with it so that you aren’t just doing surface level work on it. I’ve seen people who say they are implementing this or that but they do it in a way that is still rooted in our old traditional ways. If you are going to implement something DEMAND training on it so that your school system can create a description of what you are doing and not just putting a Band-aid on or jumping on a Bandwagon. I really am enjoying your Podcasts. Thank you for providing them for your audience. I totally agree with you and really liked the part of the quote that said… “why not talk about building a balanced program of conceptual understanding, problem solving, and skill development?” I haven’t seen this happen in my school. I just think there is a lack of knowledge of how kids learn math and that the conceptual understanding is so important. Our district uses the NYS modules Teachers were never taught the significance of all the number sense building activities that are apart of the modules so they would skip over them. Thank you so much for your BMM community. I feel like I am always learning something new and it’s always so helpful with my work with my RtI math students. Thank you again for expanding my math mind!